Great story from this eBay seller! About 20 years ago I met Jordan Ramin, who worked in Hollywood as a sound engineer for the producer Michael Todd. Mr. Ramin was a close friend of both Michael Todd and his wife, Elizabeth Taylor. 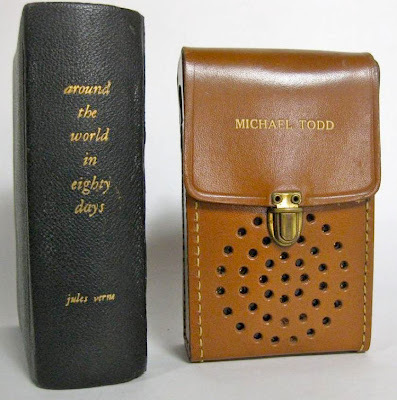 He received the Regency radio in the book inscribed with his name as did about 60 members of the cast and crew who worked on "Around the World in Eighty Days." Mike Todd was killed in an airplane crash in 1958. Mr. Ramin went over to their apartment where Liz Taylor was in a rage "...throwing things around." He asked if he could have Mr. Todd's radio, Ms Taylor threw it at him, it hit a wall near his head. She screamed " Take it you're a schmuck!" Mr. Ramin picked up the radio and ran out. Taking his new radio, his three million dollar savings and tapping his Hollywood connections, he invested in the movie concept "Smell-O-Vision". An idea whereupon different smells would be released via small tubes under the seats in the theater, to accompany appropriate scenes and enhance your enjoyment of the film. Mr. Ramin said this was an enormous failure at the premiere. All the various smells were released at the same time filling the theater with something he described as "...a giant, awful fart." People exited screaming and holding their noses. He seemed quite broke when I bought these from him at his apartment on the upper west side of Manhattan. 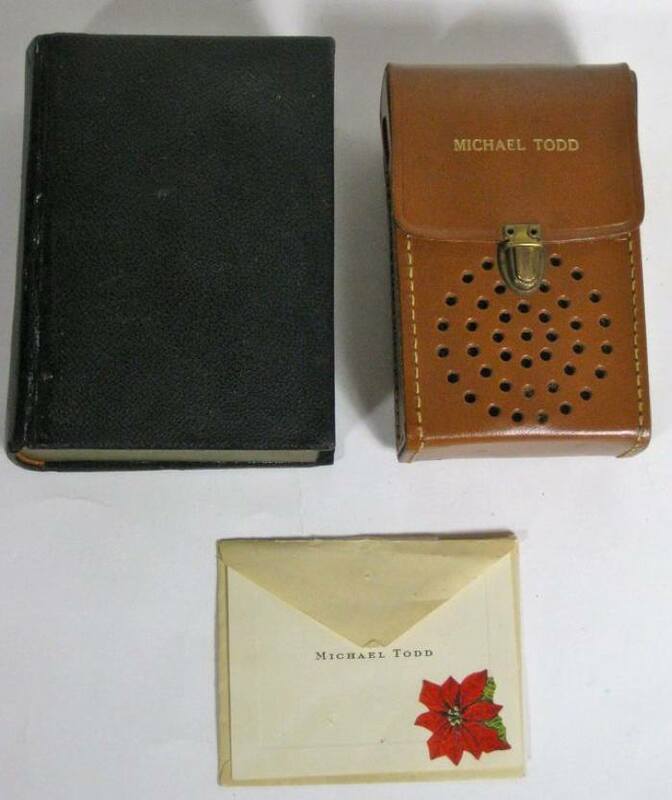 Now for your consideration these two radios will be offered as a set along with the book and Christmas gift card. Texas Instruments and I.D.E.A. started making these in 1954. 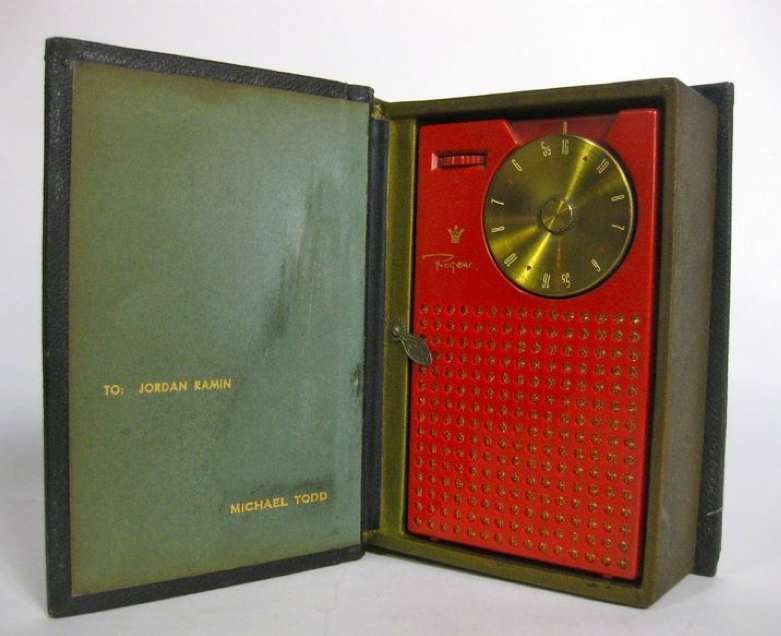 The TR-1 was the first commercially produced transistor radio, and the first pocket sized radio. This auction is for two radios, one in Mandarin red that came in an Around the World in 80 Days leather book case. Also included is a Christmas card from Mr. Todd. 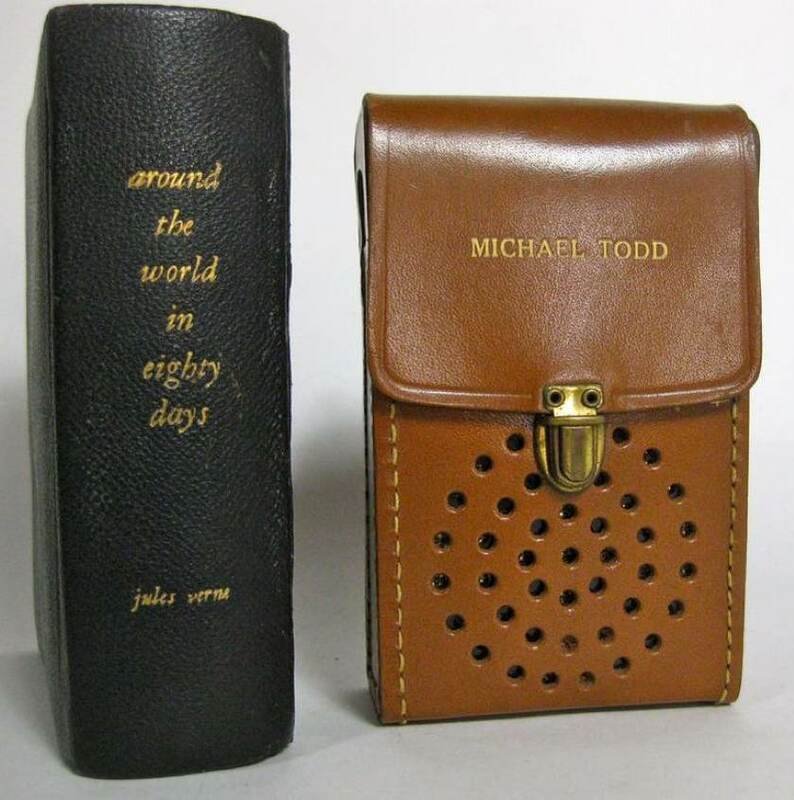 The other is in an ultra rare swirled mahogany color, with a tan leather case with Michael Todd in gold printed on the top flap. Both radios are TR-1s and in good condition. Each has light scratches here and there, the leather cases have small amounts of wear. Mahogany radio has a chip on the top right corner (Picture #5) this is probably from when Elizabeth Taylor threw it at Mr. Jordan Ramin. It also has some wear on plastic body and metal tuning dial. The red radio has no cracks or chips, just light scuffs and scratches.These were expensive items at the time, $50 then (about $400 in 2011 dollars.) Radios and cases are uncleaned, unrestored, and untested. Radios measure 3" x 5" x 1 1/4" each. Actually, that would be a good idea for a short film, spoofing old horror movies: "The Giant, Awful Fart." Jordan Ramin could be seen as a mad scientist, inventing smell-o-vision. And the Godzilla-esque or Birds-esque panic scene could be where everybody is running out of the theatre.